i like how they portrayed the difference between Jon and Dany in this one. Jon def. gets my vote for president. Yeah, we're totally team Jon in this household. very curious how the news of Jon’s parentage will get to Dany. Well, it's back and to be honest, it is already breaking the records as the rumours are saying that overnight GoT has become the most pirated series in the history of file-sharing. I guess it only tells much about how much people live Epic Fantasy. Funny fact is that so many has tried to replicate the success but all of them has failed to rise at bar with Tolkien LOTR and GRRM's GoT. I would like to add to that list Rowling's Harry Potter, as it too can be classed as Epic Fantasy. Only in this series the archmage is the enemy number one, the NightKing. All hail to the Undead Overlord ... or not, because I like the Living more. I truly wish that Jon and Dany survives. I perplexed me that Unsullied moved their army to winterfell and somehow they were not carrying supplies for those people, or for the dragons. It was truly epic to see them flying over the Winterfell, but after two year break, it didn't had same emotional load as what it would have been if they'd delivered the episodes at 2017. "We don't have time for this," Bran said to Daenerys in Stark Family reunion. "The NightKing has your dragon. The Wall has fallen and the Dead march South." Man, talking about spoiling the party that was already super icy with a chilling message. Well, we are listening now. To my surprise the meeting with the Banners was larger in than the last time. Typical to their fashion, first messages were hitting Jon in face in old fashioned way. 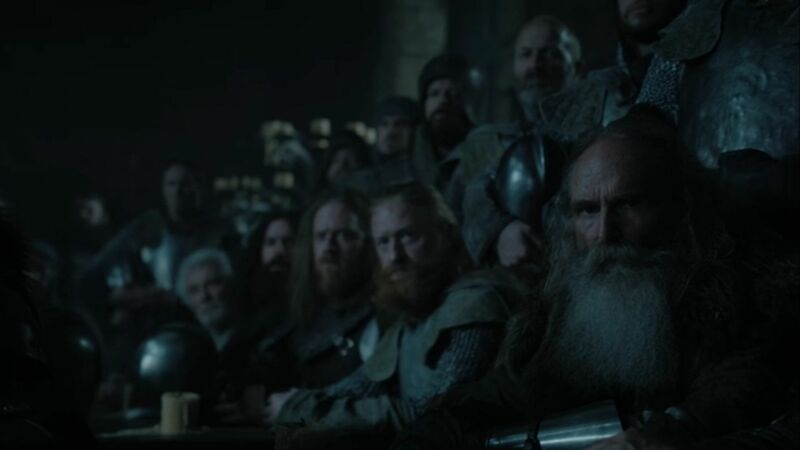 Nothing has changed in the Winterfell, and their people are always disgruntled about anything their leaders do. I don't however get why Jon didn't said, "I am still King of the North, even if I bent knee to the Mother of Dragon's. You've seen those beasts, which means we have a chance as I promised to ou went I went to get help for my people." I took the Imp to tell the truth, but even then the people complained. Sansa included. Which is kind of strange, because of GRRM's world is on the long path around the Sun, the Winter is going to be super long compared to ours, and to counter it, they should have long period of time to fill up the stocks. And make more stores. The Golden Company mercenary company arrived at the King's Landing thanks to Greyjoy treachery and a promise for the gold. Although they look fancy, what can twenty thousand men army do if they cannot kill the Dead? They have no chance in hell to survive what's coming if the armies in the North fails, war-elephants or not. And the thing is Cercei really wanted those elephants for some weird reason. Which is strange, because if she received the same message about the undead dragon breaking the Wall, what good are the war-elephants do? I loved that while Cercei was shagging the oldest Greyjoy, Theon rescued her sister and set sail in the capital vessel back around the Westeros to reach the Iron Island. If Westeros is roughly the size of the UK, Ireland included - as it has been claimed - then I finally understand why they can move so fast from one side to another. "I don't know how to ride a dragon!" Jon looked desperately back. "What if he doesn't want me to?" Oh man, we have come far away from the days of Dragonlance. In their defence HBO has done a marvellous job with the flight of the dragons as it felt truly, truly epic. This is the mystery of this episode. The black hole sun symbol made out of hands and at the centre of it dead boy. 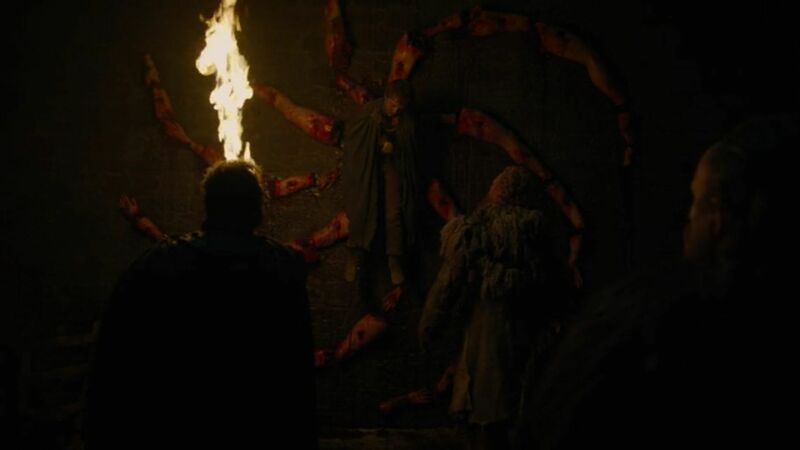 I jumped when he started screaming, but why would the NightKing use a thousands of years old symbol to show his ground? What is going on? That might have been Sansa just being bitchy. The Unsullied are not warfare newbies. They've got supplies somewhere. She even complained about the alliance's new air force. Those dragon flybys made me think of fighter jets, a clear demonstration of power. I noticed how the expression on Dany's face went from unease to a confident smile when the dragons made their appearance. I loved the exchange Sansa had with Dany. Sansa: What to dragons eat, anyway? The bannermen were not overly enthused about losing the King of the North and gaining a Queen of Westeros. They still don't seem to realize the gravity of their situation. Then, of course, Tyrion jumping in and announcing that the friendly Lannister army was marching their way didn't help. 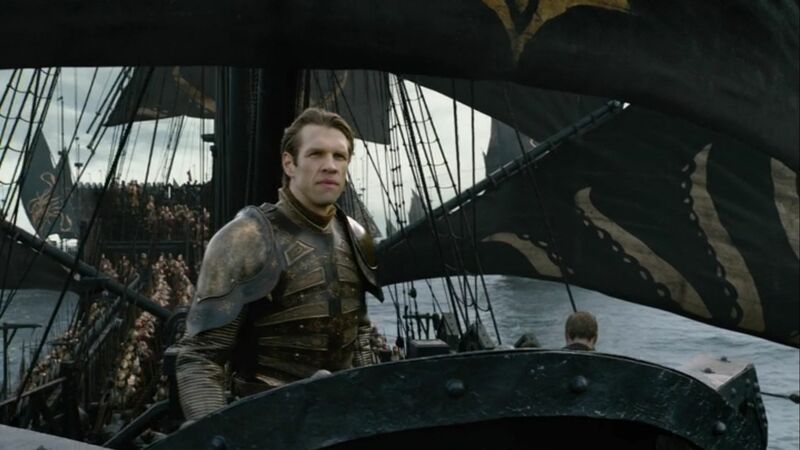 Golden Company mercenary company arrived at the King's Landing thanks to Greyjoy treachery and a promise for the gold. Although they look fancy, what can twenty thousand men army do if they cannot kill the Dead? They have no chance in hell to survive what's coming if the armies in the North fails, war-elephants or not. And the thing is Cercei really wanted those elephants for some weird reason. Which is strange, because if she received the same message about the undead dragon breaking the Wall, what good are the war-elephants do? Basically she was saying, thanks for the infantry, but what about those tanks you promised? I can't blame the mercenaries for their decision. Who wants to share a crowded boat with a bunch of seasick elephants? I loved that while Cercei was shagging the oldest Greyjoy, Theon rescued her sister and set sail in the capital vessel back around the Westeros to reach the Iron Island. I didn't think Theon had it him to carry out such a bold extraction. His decision to return to the fight in the north indicates that he still needs to further redeem himself in the eyes of the Starks. I was surprised that Cersei gave Euron the Obnoxious the payment he expected for his military arrangements. I thought that she would continue to keep him at arm's length and finally reward him with a little one-on-one session with Bodyguard Gregor. I interpreted Eron's anxious need for a performance report as a lack of confidence beneath his arrogant exterior. And let's not omit Dany's response to Jon's query: Then, I've enjoyed your company, Jon Snow. Jon’s ensuing wild dragon ride seemed intended for nothing more than to give the new power couple a little private, kissy-face time. What if he had fallen? What would that have done to the alliance? 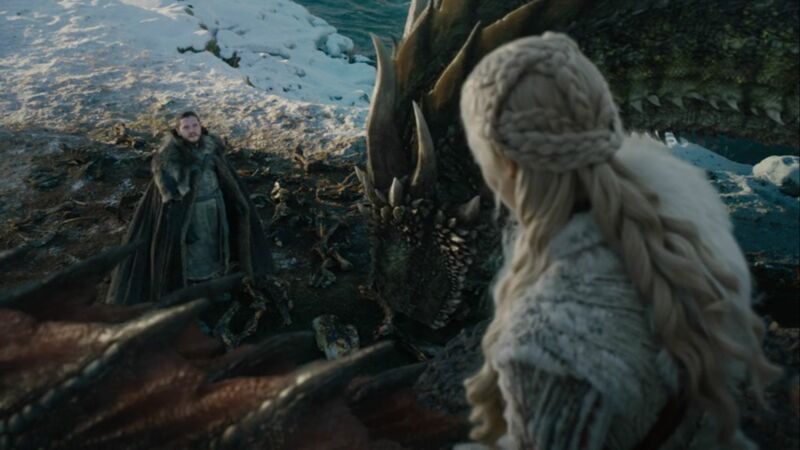 It wasn't worth the risk, especially with Jon keeping one eye on their stern chaperone, Drogan, who may not have been equipped to distinguish a loving embrace from a death grip. While this long-awaited and much-anticipated return may have fallen a short on action, it did a masterful job of laying the groundwork for the final five episodes. How is the royal relationship to be resolved? Never mind that Danny is Jon's aunt (?). How will she take the news that Jon's claim to the Iron Throne supersedes hers? Despite the fact that Jon declares he never wanted a crown, Danny tends to deal harshly with anyone who might stand in her way. Why did Jaime infiltrate Winterfell thinly disguised as a bearded brunette? I know, as Kingslayer of Dany's dad, that he is persona non grata with the aspiring queen. However, they know that the Lannister army is coming. Who did they expect to be leading it? I don't think I have ever seen elephants being sea sick. I know they can swim between islands and go for miles, but thinking about them being in cargo, and then trodding down Kings Landing narrow streets is off putting. But it would equally shown some power. Maybe the NightKing will lend her some of those undead mammoths, since she likes to be around the Dead so much. He will have undead giants as well, if she wants to exchange the Undead Mountain to a bigger one. What if he had fallen? Have you ever seen Eagles or Kites playing with their food? They "accidentally" drop their prey and dive to catch it in their claws. I believe the same thing would have happened with Jon. But bringing back the famous dragonlance, the dragon riders had a specially made saddle for them, and it aided them to keep balanced and with their ride, while dragon to aerobatics. No magic was needed. Did Bronn’s acceptance of the Tywin Memorial Crossbow and an undisclosed amount of gold mean that he has taken Cersei’s contract to kill Tyrion and Jaime? Yes, I wondered about that ... what will he do, because a trek with gold coffins and Memorial Crossbow cannot be easy. Maybe he'll go to a castle shopping first. It's just he was made an offer he couldn't decline, as it has been so many times before. The man is cursed by his reputation. Why did Jaime infiltrate Winterfell thinly disguised as a bearded brunette? I know, as Kingslayer of Dany's dad, that he is persona non grata with the aspiring queen. First, I thought it fit him well, since he has been stripped his castle, status, hand and pretty much everything else that made him the Prince Brave before. Now he is just a former general and moderately good swordsman. However, they know that the Lannister army is coming. Who did they expect to be leading it? The golden boy, from the golden company. He must earn his reputation somehow. I had forgotten what Jaime's status with Cersei was at the end of last season. I thought that the mercenaries were hired to grab the kingdoms left under-defended by sending soldiers, along with the Lannister army, to join the fight against the undead. I thought that the mercenaries were hired to grab the kingdoms left under-defended by sending soldiers, along with the Lannister army, to join the fight against the undead. What is left of Lannister's army? They have had so many clashes, and Cercei burned the city, maybe some of them alongside with them. So, how depleted it is after all these clashes? Can they even match Golden Company's size? i think jon's dragonride was also needed now, so it didn't seem weird when he ends up fighting atop Rhaegal later on. Jaime commanded at least one last lannister army. Only the baggage train part of that army got destroyed by dany. the preview for the second episode didn't make much sense to me. Dany is expecting the lannister army. So Jaime showing up shouldn't be a surprise as mentioned. What should be a surprise is that he's alone. At least for the gullible among them, and for all those who did not bother to talk to Bran about it. Why does Tormund even need to warn Jon? What is Bran doing basically... very little considering what he could be doing. I sensed something more than blacksmith sparks flying between Aryan and Gendry. Was his “as you wish” response to her request for a special weapon indicative of Princess Bride sort of feelings? I sensed something more than blacksmith sparks flying between Aryan and Gendry. Maybe, or then she was just using her charms to get what she thinks she's going to need. Does she have a white walker face tucked somewhere safe? 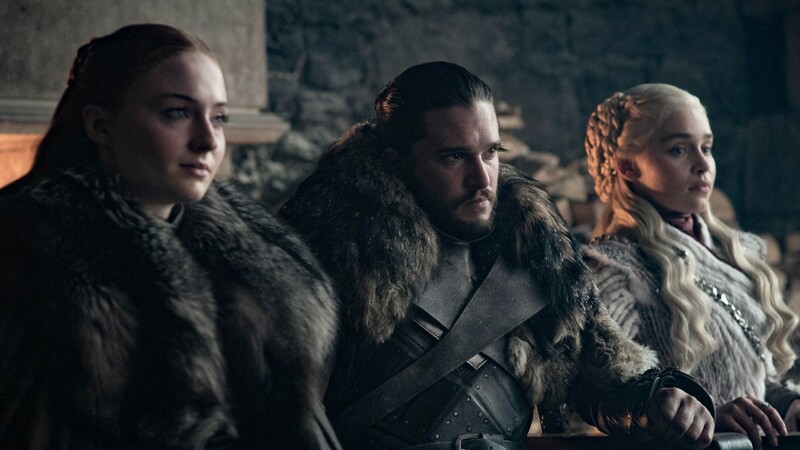 While Game of Thrones fans worldwide were watching the premiere of the latest season on Monday, Chinese fans were disappointed by a censored version that streamed online in the country. The fantasy epic on HBO is famed for its explicit content and bloody battle scenes, both known to draw the ire of China’s censors. Tech giant Tencent streamed the season premier simultaneously with HBO, minus a full six minutes of action. “I thought the censored version meant only cutting the bed scenes!” typed one enraged fan on China’s Weibo social network after watching. The Chinese version came in at 48 minutes compared with the 54-minute original. HBO’s website is blocked in China, forcing most to watch the approved-for-China version of the Emmy award-winning television series – though some managed to find ways to get beyond the country’s “great firewall”. There was lots to like about this episode. Sam's scene with Dany was heart breaking, loved the Dany and Sansa exchange, Jon and Sam, Beric and Thormund's meeting with Dolorous Ed etc. A very well put together episode setting the stage for the rest of the season. One other observation. Cersei really is as thick as two planks. ROFL - Oh man, this is so funny. I wonder what will she will do with the White Walkers? Scream at them? How about those fascinating new opening credit animations? It looks like they went though a lot of effort for only 6 episodes. Perhaps the Chinese government sees a little too much of its own reality in this fantasy. Well, here's another angle on that popularity. HBO and Chinese Communist Party left little to no choice for the general audience to break records again. This is almost like the HP mania, where people waited outside book stores, with some people literally camping to get the last book first. Game of Thrones is creme de la creme series of this time. There are others, but we don't know yet, which one is going to take the pedestal. The Mandalorian has a potential to reach this, but we know next to nothing about how it's really going to turn out. Out of HBO productions, WestWorld third season has to work perfectly to get this amount of hype and commitment.